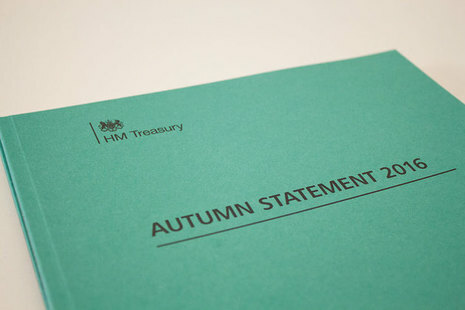 Philip Hammond delivered his first Autumn Statement and also confirmed it would be his last, with the UK's annual budget now moving to the Autumn from next year. Image: HM Treasury. The government has confirmed that the future of the Levy Control Framework will be confirmed at next year’s budget in an Autumn Statement that largely omitted the mention of renewable energy. Chancellor Philip Hammond took to the despatch box this afternoon to reveal his first major budgetary announcement but failed to mention policies in support of the renewable economy. Autumn Statement documents released immediately after Hammond’s speech do however confirm that the government is “considering the future of the Levy Control Framework”, which it intends to set out at Budget 2017. The LCF in its current guise runs until 2020/21, after which the government is due to extend it. However with the previous government having continually bemoaned a purported overspend within the framework, its future has been far from certain. Last month a National Audit Office review of the LCF found that significant governmental and administrative failings had resulted in the overspend and urged the Department for Business, Energy and Industrial Strategy to enact a raft of improvements. The documents also state the government is continuing to engage with stakeholders as it puts together its emissions reduction plan. This plan, which will establish how the government intends to meet carbon reductions set out in the fourth and fifth carbon budgets, was to be published before the end of this year but now looks all but certain to be revealed in early 2017. The government did however announce that it would maintain the current cap on Carbon Price Support until 2020/21 – a mechanism it was rumoured to be considering scrapping – and will consider appropriate replacements for determining the carbon price throughout the 2020s. While the Autumn Statement notes that it expects more than £100 billion of private investment in clean energy infrastructure, the domestic solar industry will be bemused that it has not been afforded more certainty, particularly in outstanding policy areas such as the review of business rates. Dr Jonathan Marshall, energy analyst at the Energy and Climate Intelligence Unit, said that Hammond had “failed to offer any clarity” for the energy industry “beyond the short term”. “Considering the long-term nature of energy investments, clarity more than three years into the future is vital for the industry. Vast swathes of the UK’s generating capacity are reaching retirement age, and long-term clarity on carbon pricing would provide investors with the platform to back much needed new low-carbon equipment,” Marshall added. However Dustin Benton, acting deputy director at Green Alliance, said that the industry should be cautious of the “bigger picture” emanating from the statement of overstretched public finances. “If there’s no money on the table, we should use smarter regulation to drive the investment in the low carbon and resource efficient infrastructure we’ll need for the future,” he said.